Just returned home from an interesting weekend as *CREW* for a friend of mine at the west coast selection trials for the World Endurance Championship (at the World Equestrian Games) in Kentucky on September 26th. There will be 5 US horses and riders in the race. Charisse Glenn has two horses qualified for the WEC; she asked me, along with several of her other friends, to come crew for her this weekend, and we happily jumped at the chance. It really wasn't a selection trial anyway, more of an early exhibition trial of what the horses and riders are capable of, with the Chef d'Equipe, the Team Veterinarian and a couple of other veterinarians and several selectors watching the horses and all their parameters before, during and after the ride. Three 'trials' happened this week, in Maryland, Illinois and Oregon, with all qualified horses and riders hoping to make the WEC team required to attend one of these. Riders were asked to take their horses certain distances at certain speeds... and that's all I can say. Even though I was wearing my Malibu Endurance team crew Tshirt and hat, and though I crewed all day Saturday for Charisse (and everybody else who needed help), I was approached by more than one selector saying: "You're that reporter aren't you?" ("Yes, but I'm CREWING this weekend.") "Good. That's good." I was practicing crewing for Tevis, and I figured crewing for a high stress event leading up to the World Endurance Championship would be a good prep for me. I can also say it was a fun, and interesting weekend, and I learned a few things I can safely share. This isn't a secret, because this is the second time I've seen this, though for a different reason. I saw people backing a horse up a few steps before trotting it out for a vet at a vet check. In this instance, it was done to get the horse to balance and collect itself better, instead of starting all strung out. If you really want to desensitize your horse to any situation that might arise on a ride, arrange for a staked-down tent to get caught in a whirlwind and rip straight up into the air right near your horse. If he doesn't have a heart attack or run away to China, your horse might possibly be on his way to becoming bomb proof. And most of all, if you want to have fun during a stressful time, have a good crew. 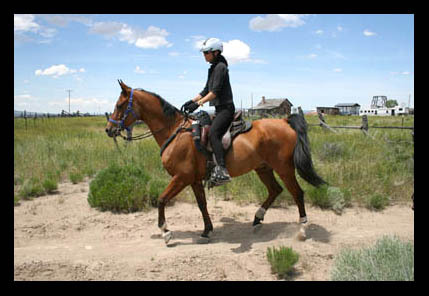 If you want more information about the US endurance trials, and would like to start cheering for some horses and riders, sorry, I can't help you... You might check out Monk's blog at: FEIRedhorse - I'm sure Chris will have an update soon. I'll post a few photos from the weekend tomorrow.